Today [24th March] a small demonstration was held in Bristol in memory of Anna Campbell. Anna died fighting against ISIS and the Turkish state in Afrin last week. Simultaneously in London people took to the streets. Today demonstrations were held all over the world in support of Afrin for world Afrin day, but the demonstration in London was dedicated to Anna’s honor and was headed by those closest to Anna. Anna was an anarchist, antifascist, squatter, hunt sab, prison abolitionist and all round radical revolutionary who had travelled to Rojava to fight with the YPJ for the Kurdish revolution. In Bristol 200 + of Anna’s friends, family and other comrades who had not had the pleasure of meeting her marched in solidarity to honour Anna’s life. The march lasted for two hours taking the main roads and disrupting business as usual throughout the city. Afrin has been besieged by the Turkish state for the past two months. And from today has been fully occupied by Turkish forces though resistance continues. The YPG and YPJ have been fighting ISIS in Iraqi, Syrian and Turkish Kurdistan. Yet the British state continues to arrest international fighters who return to England under terrorism laws and arming the Turkish state in its offensive against Kurdish-held areas. We stand in solidarity with Anna’s fight and that of Kurdish revolution. We send our deepest condolences to Anna’s friends and family. Friends, comrades and others inspired by the struggle of Anna Campbell (Shehîd Hêlîn Qereçox) and her commitment to the Kurdish Freedom Movement will be going together to the demonstration in London for #WorldAfrinDay. Meet Brighton station by the piano at 10:30am to travel together. 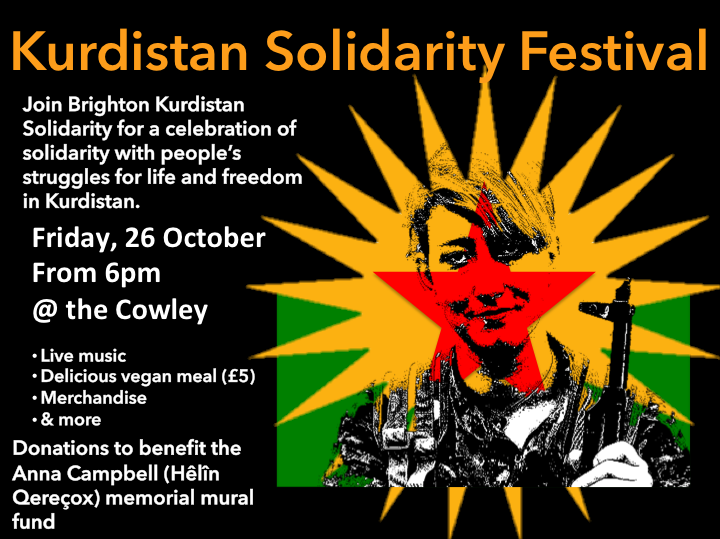 After the demonstration there will be a memorial for Anna at the Kurdish Community Centre in London. If people would like to stay overnight in London to attend the Newroz (Kurdish New Year) celebration the following day, sleeping space can be organised. Newroz has long been a symbol of struggle and resistance for the Kurdish people and its celebration has long been illegal in Turkey. The Fascist Turkish State has begun its threatened invasion of Afrin in Rojava/Northern Syria. 72 Turkish fighter jets have been bombing Afrin since 4pm Saturday, many civilians including children have been killed! We must defend Afrin with the spirit of the Kobane resistance! We call on people in solidarity with the Kurdish struggle to protest and condemn this genocidal invasion. EVERYWHERE IS AFRIN! EVERYWHERE IS RESISTANCE! The seven year long internal conflict in Syria turned into an international war, which resulted in the killings of hundreds of thousands of people and the displacement of millions, was almost nearing an end. The Turkish government under the leadership of Recep Tayyip Erdogan, together with Al Qaeda (Heyet Tahrir El Şam), ISIS and with other Salafist groups are now preparing a military operation to attack Afrin, a Kurdish city (canton) in Northern Syria. This will mean a new bloody conflict that would drag the region into a renewed catastrophe, inflicting hunger, killing more children, displacing the local population and another international humanitarian crisis. Under international law this action is defined as an “operation for invasion”. In 2017, Raqqa, the capital city of so-called ISIS, was liberated by an international coalition that included the SDF (made up of Kurdish and Arabic forces). This was the start of the end of ISIS. This new situation of ending the horrific war raging through Syria, finally led to a political dialogue for a possible solution for peace in the region. Any Turkish military attacks on the Kurdish city of Afrin will only initiate the start of yet another bloody conflict. The safest and the most stable areas of Syria, are those regions that are now under the administrations of Kurds and their allies. One of these cantons is Afrin. Afrin became a safe haven from the begining of this war, freed from any conflict and war. Neither Afrin Canton, nor the other northern Syrian Kurdish regions, have ever attacked or threatened to attack Turkey. In fact, Turkey has constantly threatend and attacked the villages and localities several times in recent years. The legal definition of Turkey’s actions, in the international law, is defined as “attacking a sovereign country”, invasion of their land and unprovoked assault on their civilians. This act is an example of Turkey’s long enmity towards the Kurdish community. Afrin has been one of the most stable and secure regions in Syria over the past five years. With this in mind, the city has taken in as much as its original population in IDPs. The UN and the International Coalition must ensure the continuation of Afrin’s stability and security. Afrin must be protected against external attacks. Afrin is not a threat to Turkey and has not attacked anyone. The Turkish state is attacking Afrin because it is against the Kurds and Kurdish gains. This reality must not be neglected and the Turkish state’s attacks must be prevented. Russia, who is responsible for Afrin’s air space, must not be a spectator to Turkey’s attacks and must prevent any such show of aggression. The attacks of the Turkish state against Afrin, Rojava and north Syria as a whole is beneficial for ISIS and other Salafist groups. The International Coalition Against ISIS must take precautions against this and must prevent the Turkish army’s attacks. 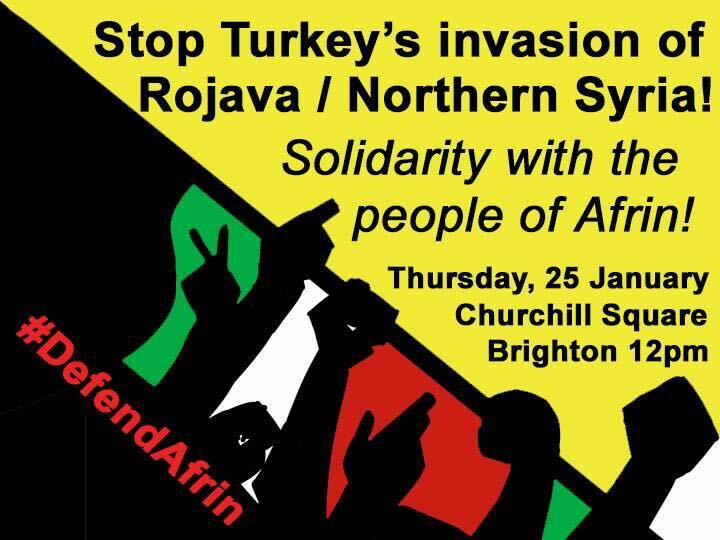 Kurdish Solidarity Network meeting 10-11 February in Brighton. We can now confirm a meeting date on 10-11 February at the Cowley Club in Brighton. A suggested outline for the weekend is to have meetings (including breaks) from 12-6pm on Saturday 10th, followed by social time in the evening, where we can also, for example, organise a film, talk, or other activity, then optional time on the Sunday for workshops around themes… for example, “what is solidarity?”, or “History of the Kurdish Women’s Movement”… whatever people are interested in / would like to offer. If you are able to come to this meeting, please send an email to brightonkurdsolidarity@riseup.net with the name of your group (individuals are also welcome), number of people, whether you need crash space and for how many people and which night(s), any dietary requirements, and if you have something to offer or a suggestion about what you would like to see happen. If you’ve ever visited the Cowley Club in Brighton it’s a great community resource and worth defending. It’s struggling financially due to the council imposing punitive business rates. If enough people set up a small standing order each month from their bank account we could thwart the bureaucrats and developers by keeping our radical social centre alive. A tiny amount you won’t miss, even one pound a month per person would be a massive help! 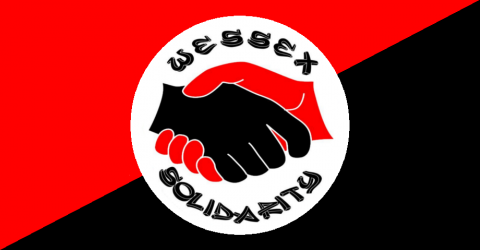 Co-organised by the ESRC STEPS Centre, members of the Sussex Kurdish Community and members of Brighton Kurdish Solidarity, join us for the screening of several short activist-produced films, followed by a panel discussion with key speakers Janet Biehl, Ercan Ayboğa, and Dilar Dirik.